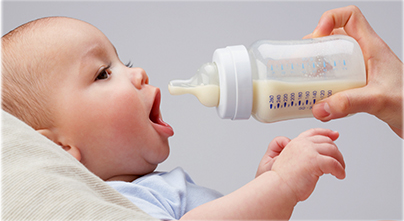 Feeding your baby should be simple withso many choices of formula as preference. However, for some babies, they begin to develop hives, eczema, vomiting, diarrhea or other symptoms like fussiness or colic after drinking formula. This can be related with a milk protein allergy. While this is rare – appearing in less than three percent of infants that receive formula, it can still happen. In such kind of condition, you need tomake a switch to a hypoallergenic formula for your baby. A common misconception when it comes to formula is that hypoallergenic formulas are not made from cow's milk. The truth is that they are made from cow's milk, but the proteins are broken down in such a way that they are more easily digested by those babies with certain allergies, allowing them to avoid the symptoms that will be shown asan allergic reaction. The first is that your family is prone to allergies or highly atopic. Your family members suffer more from eczema, asthma, food allergies or even seasonal allergies like hay fever, and, therefore, the infant has the potential to have allergies, so preventative measures need to be taken. A second situation where your infant may need hypoallergenic formula is if he or she is intolerant of proteins in both breast milk and formula. There is one more condition that the individual need to turn to hypoallergenic formula. That is when you have numerous food allergies and are diagnosed with eosinophilic esophagitis (a condition not occurring in infants). When it comes to hypoallergenic formula, parents should be aware of the various factors involved, including the different types of formula. This means the cow's milk formulas, the soy formulas and the hypoallergenic formulas. For the first two types, the formula is based on cow's milk and soyrespectively. Additives are introduced and elements are removed until the final product exists. However, with hypoallergenic formulas, there are two types due to the extra steps that are taken in making it. Examples of this type of formula are Alimentum, Nutramigen and Pregestimil. In these formulas, the longer chains of milk proteins are broken into amino acids and shorter chains so that they are more easily digested. These are more expensive than regular formulas, and there is no requirement for an insurance company to pay for these formulas. Also, there are still some protein chains in this type of formula, so an allergic reaction is still possible. Examples of this type of formula are EleCare, Neocate and Nutramigen AA.In this type of formula, there are no intact milk protein chains. Instead, the formula contains only amino acids. This kind of formula doesn't taste as good as others, but they are the easiest to digest because they are broken down so well already. When it comes to infants, there is very little room for error. Therefore, if your infant begins to show a single symptom of food allergies, like rash, diarrhea, painful or bloody stools or crying that occurs consistently at feeding time, make sure your pediatrician know these conditions. They can help you troubleshoot and try to find the best alternative for your baby. Babies who cannot tolerate extensively hydrolyzed formulas do grow well on free amino acid-based formula, provided they do not reject it because of the taste. For this reason, it is good to be keeping your pediatrician aware of what symptoms are occurring, so they can help you find the best formula that will keep your baby healthy and growing. Keep in mind that breast milk provides the best nutrition for babies, and even those with food allergies can benefit from breast milk. If your baby seems to have food allergies and is breastfeeding, the mother will need to eliminate foods from her diet to keep baby's reactions to a minimum. This is called an elimination diet which allows the mother to continue breastfeeding and provides allergen-free milk to the infant. Carbohydrates: Corn syrup, sucrose, tapioca and corn starch are added to the hypoallergenic formula as a way to make up for the lactose that has been removed to make the formula hypoallergenic. Therefore, the infant receives significantly more carbs than they would receive from a normal formula with lactose. This is a problem. Salt: There is 30 to 90% more salt in a hypoallergenic formula than a cow's milk or soy formula. Fat: Medium-chain triglycerides are the main fat blend found in Pregestimil. These are man-made fats and should not be used as an infant's main source of fat because they do not provide the essential fatty acids to the healthy growth of the infant's brain. So the better alternatives are Alimentum or Nutramigen, as they contain the same fat blends that are found in cow's milk formulas like Similac and Enfamil. Price: The cost of hypoallergenic formula is very high. They are four to five times the price of a formula that is made of cow's milk or soy. That is quite a large amount of cost when you are trying to buy other essentials for a newborn.